Went to Sun With Moon for dinner today, and for dessert I had the tofu cheesecake. Even as an admitted dedicated carnivore, the tofu cheesecake was delicious. 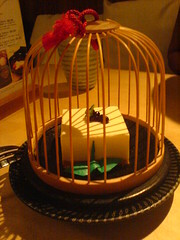 But the best part was the presentation - the little bird cage, the folded paper crane, the tiny little mint leaf. I particularly liked the way the shadows fell on the cake. It was almost a pity. That might almost qualify as : An Ode to a Tofu Cheesecake. So did you get to keep the cage? screwy - it was surprisingly not that expensive. I certainly wasn't expecting the fancy presentation. anon - no, the cage stays with the restaurant. I know why the caged tofu sings.